Aging skin can be a nuisance to achieving a healthy, beautiful skin, regardless of your actual age. Of all the areas where signs of skin aging can show up, the delicate skin around your eye area often bears the first blow. To prevent and correct signs of aging on these spots, products that are specially formulated for the eye area are a must for aging gracefully. What is Skin Doctors Instant EyeLift? Skin Doctors Instant EyeLift is a specialized daytime and nighttime care that stops and reverses signs of skin aging around your delicate eye area. It has the sheer consistency of a serum that quickly penetrates your skin so that it can readily act on your eye skin concerns the second your skin absorbs the formula. Who is the Manufacturer of Skin Doctors Instant EyeLift? This product is brought to you by Skin Doctors Cosmeceuticals, a global brand of skin care products with a marked presence in the industry and is available in over 50 countries worldwide. The company takes R&D seriously, closely working with cosmetic surgeons and research institutes in bringing innovative formulas that are made only with ingredients proven for their efficacy in enhancing skin health and quality of appearance. How Does Skin Doctors Instant EyeLift Work? This product promises to give you visible improvements to your eye skin that lasts for up to 8 hours. First, it floods your skin with moisture that seeps through cracks and creases in your skin matrix to make your wrinkles appear less prominent. Second, it gives your skin an instant lifting effect that creates a firmer, fuller skin. Third, it improves how the surface of your skin appears by creating a film that reflects backlight. 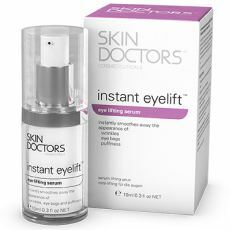 Skin Doctors Instant EyeLift Ingredients – Are they Safe & Effective? Biocare SA: This is a proprietary combination of albumin and hyaluronic acid, key ingredients that work together to boost the moisture content of skin around your eye area and keep it well hydrated over a longer period of time. In effect, these ingredients plump your skin and leave the surface of your eye skin more even and smoother in appearance. Sodium Silicate: This ingredient helps hold moisture in. It also forms a thin film on the surface which instantly tightens your skin and gives it a more lifted appearance. Skin Tightener ST: Another proprietary combination of components derived from marine algae and wheat protein which, together, gives this product the ability to further tighten and lift loose and saggy skin. What are the Advantages of Skin Doctors Instant EyeLift? This product has been formulated with leading research institutes and cosmetic surgeons who know what ingredients the skin responds to the best. The manufacturer has a strong R&D culture. This product has been specially designed for use around your delicate eye area. There has been no reports of any major side effects experienced by users with this product. Product pricing is inexpensive compared to other similar products that promise to deliver the same results. What are the Disadvantages of Skin Doctors Instant EyeLift? This product specifically addresses wrinkles, eye bags, puffiness, and loose and sagging skin only. Users report experiencing varying degrees of product effectiveness depending on skin tolerance and responsiveness to this product’s formulation. How Should You Take Skin Doctors Instant EyeLift? 2. Pump a pea-sized amount. 3. Dot the product around your eye area. 4. Spread evenly in an upward motion, gently massaging the application area as you blend it with your skin. 5. Do not move your skin for about 2 to 3 minutes or, until the product has dried up and you feel your skin tighten. How Much is Skin Doctors Instant EyeLift? This product costs $39.95 for a 10 ml bottle. What Kind of Reviews are Out there for Skin Doctors Instant EyeLift? Majority of users are satisfied with the lifting and skin smoothening effect of this product on their skin. Many of whom say that just a tiny amount of product is necessary to obtain the benefits promised by this serum. If you care enough about your eye skin, this product will bring you salvation from eye wrinkles, bulging eye bags, puffiness, and loose skin. It redeems your eye skin from multiple signs of visible skin imperfections as it undoes years of damage that are etched on your skin. The change that you see on the surface though is also a reflection of the improvements that are happening underneath your skin. When you’re ready for a new eye skin to reveal, make Skin Doctors Instant EyeLift your new partner in combating signs of aging skin.